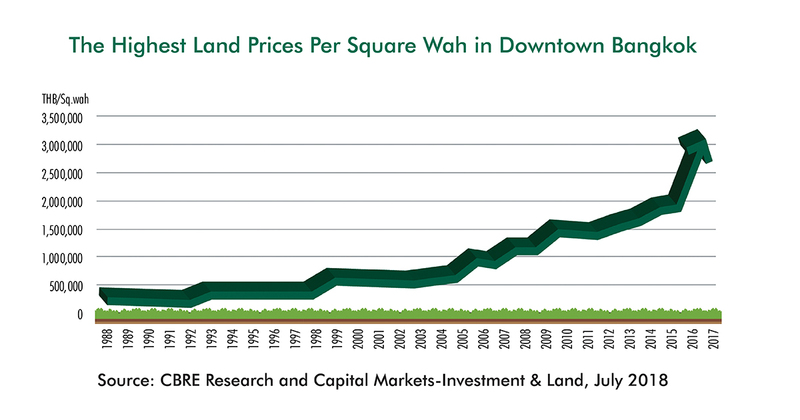 CBRE Thailand reveals land prices in central Bangkok have risen by 1,000% since CBRE established an office in Bangkok in 1988, 30 years ago. Since setting up an office in Bangkok in 1988, CBRE Thailand have identified a 1,000% increase in land prices across the city over the last 30 years. a 21-1-08 rai (8.5-acre) site on Wireless Road, (which was the Standard Chartered Bank manager’s house, now the All Season Place development), by the M Thai Group for around THB 250,000 per square wah. The latest sale in Sathorn was the 8-rai site of the Australian Embassy for THB 1.45 million per square wah in 2017. In Lumpini, SC Asset paid THB 3.1 million per square wah for an 880-square-wah site on Soi Lang Suan. The largest land sale in terms of value was the sale of the 23-rai British Embassy site in 2018 to the Central Group / Hongkong Land joint venture. The popularity of Bangkok’s mass transit routes with over 1.2 million users a day has increased land values next to stations, but not every line or station is equally attractive. Land values have been partially determined by the popularity of a line and a station. “The other big determinant of land prices has been urban planning and building regulations, particularly those governing how much space can be built, obviously if less space can be built on a site then the land is worth less,” commented Ms Kulwadee Sawangsri, Executive Director, Capital Markets – Investment and Land, CBRE Thailand. The rate of increase in land prices will depend on the level of development activity and the returns that can be generated from development; which will vary depending on what can be built and how much customers can afford to pay either to buy or rent in the completed developments. As the number of freehold potential development sites in Central Bangkok declines, CBRE expects that land prices will continue to rise. And in some cases, land prices will be higher than the value of the existing building on the plot and increase number of older will continue being demolished, and the sites redeveloped. At the moment, the condominium law requires that 100% of co-owners agree to revoke the condominium enabling it to be sold and redeveloped. This has not happened to date although there are now some condominiums where the total value of all the units is less than the vacant possession value of the land on which the condominium has been built. CBRE thinks it will be very difficult to get 100% of condominium owners in Bangkok to agree to sell all the units to a developer. “Assuming that planning regulations do not change and the amount of space that can be built on sites remains the same, then Bangkok’s CBD land prices are likely to continue to rise,” concluded Ms. Aliwassa Pathnadabutr, Managing Director of CBRE Thailand, who has worked for the company for 30 years since its establishment in Bangkok. For more information or to discuss Bangkok's land price increases, phone or email Ngamjai Jearrajarat Head of Marketing and Communications, CBRE Thailand via the contact details listed below.